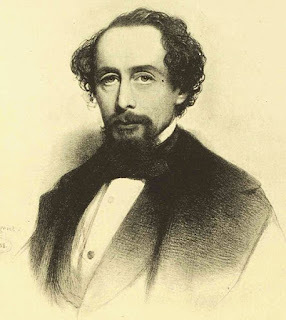 The primary essence of Charles Dickens’s art lies in his ability to transform the mundane visible reality to an altered quasi- symbolic environment, where the characters get elevated to a sphere of symbolic existence. Fundamentally dealing with the destructive forces of industrial revolution and the deliberate distortion of Utilitarianism to confine human Imagination, his novel Hard Times explores those arenas, which enable such an examination with greatest proficiency. The way in which the horse riding takes on its significance illustrates beautifully the poetic-dramatic nature of Dickens’s art. The presence of the circus group finds the first mention in the chapter “A Loophole”, where Mr. Gradgrind drags his children away from the apparently destructive influence of the sight of a circus. Mr Gradgrind finds Tom and Louisa peeping inside the circus tent. The initial descriptions in Hard Times present the circus people as representations of human spontaneity, a sense of buoyancy and poise. Their skills have no value for the utilitarian calculus, but they express vital human needs. Their actions generate in the lives of the Coketown people, not only amusement but art. In investing a traveling circus with this kind of symbolic value, Dickens expresses a profounder reaction to industrialism than the obvious process of direct satire. For some critics, it can not be contended that the horse riding depicted in the novel is real enough. 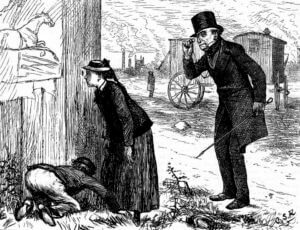 There would have been some athletic skill and even some bodily grace among the people of the Victorian traveling circus, but surely so much squalor and vulgarity too that we must find Dickens’s portrayal a product of sentimental falsity. However, a closer examination proves that beneath the apparent presentation of the circus people as possessing “ a remarkable gentleness and childishness”, there is a far deeper portrayal of realities, even through the operation of metaphors. In fact, Sissy’s symbolic significance is bound up with that of Sleary’s horse riding where human kindness is very insistently associated with vitality. The circus embodies and its members dramatize the social paternalists’ trope: the family-society metaphor. The unrelated individuals of the circus society come together and behave like a loyal family. 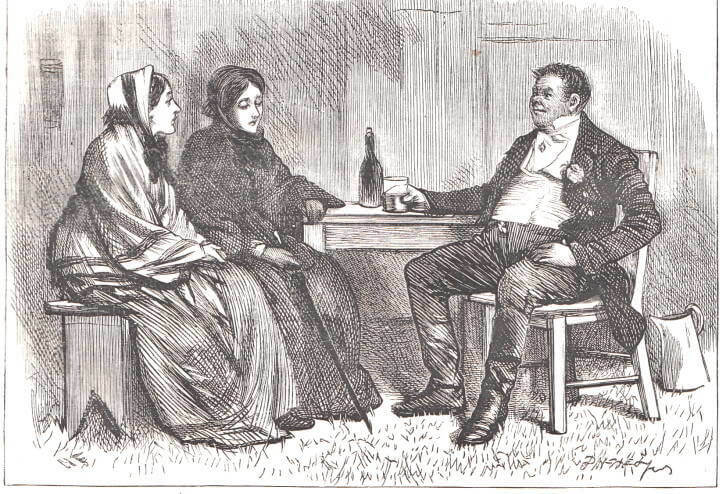 The whole group interacts as an extended family, which is stressed when Sleary explains to Sissy the advantages of staying with the troupe: “Emma Gordon in whothe (whose) lap you’re a lying at prethent (present), would be a mother to you and Jothpine (Josephine) would be a thithter (sister) to you”. 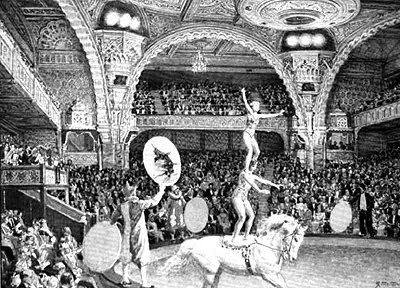 The circus in Hard Times, is both a metaphor in itself and the novel’s major symbol of fancy, the metaphor-making element. As critic Louis James describes, “Dickens’s championing of Sleary’s magical circus against the schoolroom in Hard Times is a paradigm of his contribution to the social novel: he transformed “facts” through the entertainment of the imagination, making the reader see social reality in a new light.” The circus master, Sleary, is adept at turning one thing into another. In his most important act of transformation, he helps young Tom escape by turning him into a black servant and then into a country bumpkin. The transforming power of fancy literally (and ironically) saves the Gradgrinds in the end. However, such a salvation is full of ambiguity and even humiliating. In that respect, even the depiction of the circus people is ambiguous to some extent. The narrator initially describes the circus as a place of harmless but nevertheless ridiculous ostentation. Sleary himself is an icon of modern commercialism : “ Sleary… a stout modern statue with a moneybox at its elbow, in an ecclesiastical niche of early Gothic architecture, took the money.” Dickens delights in exposing the circus’ illusions, in revealing the often-shabby reality behind the fanciful show. Master Kiddermaster, the dwarf, is unmasked as he is described: “ in private, where his characteristics were a precocious cutaway coat and an extremely gruff voice…” Furthermore, Kiddermaster, like Sleary, is an unabashed (unashamed) mercenary: “ if you want to cheek us,” he exclaims to Bounderby, “pay your ochre at the doors”. In the circus, therefore, Fancy and its major mode, the metaphoric transformation, often produce showy illusions that are akin to the self-aggrandizing (self important) mendacity (deception) depicted in Hard Times. Curiously enough, close to the end of the novel, a clown at a circus performance tells a curious riddle, that even can be considered as the novel’s psychological icon; that is, the riddle concerning the structure of the threes, the psychological stages of sowing, reaping and garnering, or youth maturity and old age. Solving such a riddle is all about solving the conflict between “Fact” and “Fancy”, forces that are reconciled only in the lives of the circus troupe. Their attitude comprise of realizing what life is all about…living to the lees, and yet living it on the lines of complete fellow feeling.